I have a secret, a deep, hidden secret. It's not a long hidden secret, just since I moved here, but it's a secret I am glad my mother never knew I had. She would be even more shamed to learn this secret than she was when she discovered that both my sister and I read while eating our meal, breakfast or lunch when we are alone. Not dinner, we still have some standards to maintain. It's time for me to get this out into the open and I have taken steps to remedy my poor behaviour. So here it is. In all my fourteen months here, I have washed up after dinner perhaps five times. Dishes have been rinsed and left till the next day to be washed. Well, that feels better. It may not look good but it certainly looks better than discovering the cutlery still has bits of last night's meal on it or there is still a scrap of onion in the frying pan. My kitchen is small and U-shaped with sink across the bottom of the U. Unfortunately, the light is above my head and well behind me as I stand at the sink. There is a large shadow over the sink and even if I lift dishes to the side, it's not always easy to see if they are really clean. I had planned a dishwasher and was assured there was a cupboard already set up for one. True in some other apartments perhaps but not this one. I am glad I did not order one to arrive with new washing machine and refrigerator. I'm considering what to do with the kitchen and am on my way to finalising plans. However, I still have light problems. I was in Kmart the other day and found this LED light with an extremely strong bulldog clip. It was just $15. "Let there be light!" I have it clipped onto the bottom of what is supposedly shelf for microwave. The cord is wound up onto two small hooks I stuck to tiles and the transformer plugs into the point on the shelf intended for microwave. I can bend the light to shine right into the sink. The shelf is too high for me to safely use microwave up there as it is placed where the cook has to stand side on to use it. Not good design, one of the few bad points I have seen here. Generally the design is well thought out and well built. Picture was taken with main light out so the brightness of this could be seen. It's not terribly attractive to me, but scraps still on plate are worse. I'm not worried about it falling. The clip was so strong I needed two hands to open it to clip on to shelf. The jaws of the clip are rubber lined for extra grip. I have started three separate designs for the Old Jeans merino from the Yarnyard in Britain. Each has not really worked. Today I found this mystery shawl pattern. It's been ages since I did something like this so I signed up. Nine clues delivered to my pattern library on Ravelry through June. I've done the first which was only 18 rows long. The very first mystery shawl KAL I did was on a Yahoo group many years ago. I was a total beginner at lace and really had little idea about watching the pattern develop, or about reading charts, I used the written instructions. I could not make my stitch markers work properly. I realise now that stitch count varied between rows and in repeats. I was always looking for the omitted YO or finding where I hadn't knitted two together. To really cap off how much I was out of my depth, I had picked a pattern with lace on both sides, not just on the right side row. I struggled a lot and eventually gave up when I could not fudge any more on the stitch count and when I realised pattern was all over the place. I'm older and wiser and more skilled now. Cindy posted a picture of her labs having a ball with a pile of iceblocks she threw out of her freezer. In an email, she suggested that a picture of the inside of my freezer might be better than one of my handbag. Actually, I keep my handbag fairly tidy and go through it regularly. So, back to the freezer. I actually have very little to do to clean my freezer. Once I had a small build up of ice on the edge of the runner of the iceblock drawer where I had spilt some water. Frost doesn't build up in it at all. It's just contents which need sorting from time to time. So here goes. The fridge itself is a medium-large Electrolux, stainless steel. Even with just one person here, it often has quite a lot in it. For a large fridge, the freezer is not convenient in my opinion. It's awkward to fit stuff into. I try to buy food when on special and then work my way through it before buying anything more. Now the very large box which has been just poked in is a box of chicken souvlaki left over from Mother's Dy when five fewer people than expected were here to eat. I've been told son "must pick t up." Now he's still not driving himself and is not comfortable in the car, but DIL actually goes past here a couple of times a week and could call in. I suspect their freezer is also fairly full. Underneath the souvlaki is some shortcrust pastry. I'm afraid I'm not as good as my mum used to be in making pastry. One son once remarked to me when he was still at primary school that my meat pie was worth 9/10. However he said that grandma's pie was 12/10, the difference being her homemade pastry. The bottom shelf has an iceblock storage drawer and the trays to make them. This is often a nuisance and it's built in and can't be moved. Next to these is a tray of stirfry lamb, one of free range organic chicken and a tray of pork and fennel sausages. And some raw peeled prawns with tails on. A kilo pack of these is under $20 and does me a lot of meals, six or more and feels like a treat.The top also has two unopened packs of raspberries which go on my raw muesli every morning. Two? I don't know why. Here's the door. Two cold packs, some frozen dry yeast and an open pack of grated cheese. Some frozen vegetables. I prefer fresh but keep frozen too. The nondescript plastic bag contains a very meaty ham hock for some soup. I found buttons for the little Aviatrix hat in the post below and sewed them on. I made some small cuff's for the baby's big sister. My granddaughters love the cuffs their mum made them a couple of years ago. These took about an hour from start to finish to make the two of them, including the intricate embroidery. All is now packed up with a gift for mum too who's had a rough time with both the pregnancy and he weeks since the baby was born. It's even been posted. So am off to cook the pork and fennel sausages for dinner with some vegetables too. Another little Aviatrix from Justine Turner at Just Jussi. This is one of her free patterns. I've bought some and used the free ones and was lucky enough to win a couple of hers as well. They are all cute and up to date in styling. No pretty lacy gathered matinee jackets as were done by my ex-husband's grandmother. A skilled knitter, she made stuff for babies that was at least fifty years out of date. I dressed each of my boys once in these beautiful jackets so she could see them wearing them. Then I packed them away. As Ailsa says in a recent post, this little hat is instant gratification. I made it from start to finish yesterday afternoon, in between doing other things liker cooking dinner and doing some tidying. Jussi has written this pattern in a variety of sizes from three months to adult and three separate weights of yarn. All clearly set out and easy to follow. I've now made five, I think. This one is for the youngest son of an online friend. She's had lots of trouble with this one from during the pregnancy till now when he is four months old. She also has several other children, so her knitting time is fairly limited. Now to find some buttons. I have been a model of domesticity today. Shopping, cleaning, vacuuming and cooking. And some knitting. This is the hat for my son done in Bendigo Serenade, colour asphalt. After two false starts I have finally decided on a very simple 2x2 rib and am getting close to halfway. I probably am about at that point but want to make a decent turn back. He spends a lot of the winter months watching his children play sport on windswept playing fields, so I think double over the ears will be a good thing. I didn't like the first design so ripped it back and had moss stitch for the second. I'd done quite a bit when I realised that it might not be enormous but was probably too large to be comfortable, so I ripped that back too. It's easy to knit and the first few metre show little sign of being undone twice. The photo was taken outside after 5:00 pm today when the light was rapidly fading. After shopping I cleaned, including vacuuming and doing the bathroom. I'm always surprised how messy the kitchen gets and how many crumbs etc just one person can drop. However, it won't clean itself up so I have to do it. When I returned from shopping , I started the chilli beef soup Cindy posted. As usual, I changed the recipe or at lest the method. I put all the liquid in the slow cooker, cooked the meat, garlic, onion and spices in the frying pan and added them to the slow cooker. I cooked it pretty well all afternoon and it tastes great. I wasn't happy putting a bowl of soup in the oven to cook, even with lid on. My left shoulder has been very painful lately and I didn't want to have to lift a heavy pot of hot liquid from the oven. I've now put the rest in the fridge in a container for more lunches. I meant to add: I used three cups of stock instead of five and cut down other ingredients too. Tomorrow the crockpot will be used again for cooking quinces. I bought four today, all a medium size. I love them and I love the wonderful aroma through the house as they cook. I might even be very busy tomorrow and cook some bread which I haven't done for quite a while. I don't eat a lot of sweet stuff but make an exception for lemon butter. I used to make a double big batch of this many years ago, but this batch was small. Whisk two eggs and an extra two egg yolks in a saucepan with 3/4 cup of caster sugar. Heat very gently stirring all the time till it thickens and coats the back of a spoon. Strain and put in container. When I made this years ago it took ages. As I said, the recipe was bigger and I doubled it. I also used a double boiler for cooking which is slow. I do think the boiler makes a smoother result, but I had no combination of saucepans or bowls which would work well. I watched this very carefully and stirred well. I have quite a few lemons left. friend is coming to dinner one night, so I think I'll treat us both and make a lemon delicious pudding. The cockatoos are becoming a menace here and their raucous call is definitely not a sweet serenade. I noticed yesterday they they have attacked the plants in the large planter boxes on the outside of my balcony balustrade. They've pulled out leaves and left them in the box. I think there's less food around as the weather gets colder and they are trying new stuff. Two nights ago, I glanced out and saw a terrible mess on my table and floor outside. My pot of hyacinths which I bought a couple of months ago was on the table and potting mix was all over the place. The hyacinth bulbs themselves had been attacked and all three of them were over half eaten. Then the following night, they excelled themselves. 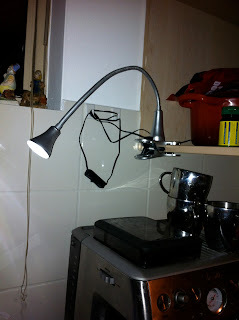 The picture shows the solar powered light which had been on the table. Nothing to tempt them to eat, not plants nor flowers. This was a sphere with small cutouts of the plaster in a vaguely Moroccan style. I don't think I've left anything out there now to which they might be attracted. I would not have recognised this as a tulip if I had not seen it last Sunday. These were the miniature tulips given me by one of my sons. They have opened up to be almost completely flat. They are still attractive but I'll probably have to throw them out tomorrow. They have a very waxy look to the petals but the stems are beginning to curl over. I've enjoyed looking at them through the week. And finally the real reason for the title of this post. The dark grey/black is Bendigo's newest offering. The yarn itself is called Serenade and the colour is Asphalt. It's 80% wool and 20% bamboo. There's a slight sheen to it and it feels as if it will be pleasant to knit. It's 8 ply, DK. I made a hat for each of my sons last year but the middle son passed his on to his son. He really wanted black and I used a dark blue. I've been through my stash and don't have enough black of any ply to use. So I've ordered one of the Serenade. I hope it's dark enough for him. Just something plain and warm which will come well down over the ears is what he wants. The green is more of Bendigo's Melody, a mix of cashmere, microfibre and merino. I've done shawls and other things with this before, although the real reason I bought this was to take the total of my order over $30 to get free postage. It won't go astray. I think I'll use some of this for some fingerless gloves for an old lady now in Canberra but who has lived all her life in far North Queensland. She really does not like Canberra's cold weather. Minimums overnight this week have been mostly well below zero. Now to get dinner on. Pork fillet in the tagine with preserved lemon, star anise and whatever else seems to suit. Herewith one poor photo of leek and asparagus soup. Wrong exposure possibly and too much light and shininess. However, I couldn't be bothered taking it again. Here's my lunch today and possibly another two days, certainly one. I don't struggle to eat 5 serves a day of vegetables, I like them a lot, but there are times when there are still bits left in my fridge and another delivery is due. Like today. I finely chopped an onion and about 10 cm of leek which was from the bottom of the vegetable drawer. I had two small bunches of asparagus which hadn't been used for family lunch on Sunday. I chopped that up small too, heated a bit of oil and tossed everything through. Then I put the lid on, turned the gas down and sweated them for about five minutes. I stirred through a couple of tablespoons of arrowroot which I use here for thickening. It is gluten free, something I have to take into account with a granddaughter who is coeliac. I added a good grind of tangy pepper and one of the jellied oval stocks, chicken, from Continental. Some water stirred through. I cooked it at low heat for about ten minutes and then tasted it. I find the Continental jellied stock fairly salty so always taste once it's dissolved. Then some chopped parsley and about a third of a small container of thickened cream, also a leftover. As you can see, it's fairly chunky soup. It was really good with a fresh roll and used up stuff from fridge. I struggle sometimes with lunch, but it's been cold up here lately and soup was good. I have finished at last my greeny/blue Brangian shawl from Yarnosophy. It's also in a completely corrected version on Ravelry. This is my fourth of these. The name "Brangian" may be a forerunner of the name "Bronwen. "It is shown here but it still needs to be blocked. Ends also need to be sewn in. I seem to have been talking about this for ages, so took a photo, even unblocked. As you can see it's quite large and will be bigger when blocked. Designer is Bronwyn Parry who lectures at UNE at Armidale and also writes romance novels, although I did not know that when I made the first of these a couple of years ago. The yarn is Madeline Tosh Pashmina, colour Cousteau. I bought the yarn from Jimmy Beans in USA and the service was quick and pleasant. And finally a bit of fun. My grandmother and I used to love liquorice and we would buy one of every type of liquorice sample bags at Sydney Easter Show. Then we would sit in the grandstand and gorge on it while watching the mounted police rides or similar. I haven't been to the show in years and liquorice tastes different now. It seems more bitter and with a less rounded flaovour. I tell my sons I don't want Mothers Day presents. This year I was given a fancy tin of liquorice. These look like another old favourite, boiled lollies. My grandmother always had a jar of these on her Silent Knight fridge. They had flavour then, often of the fruit which they portrayed. I know sweets which look the same are still available, but to me they are just another sweet. These shown here are entirely made of liquorice, a novelty item. Some taste more of the traditional flavour, some of the pieces are the salted liquorice and some are quite spicy. All in all, a bit of a laugh. A very busy weekend here and no knitting done. I was out all day Saturday and then yesterday the family converged on here for Mother's Day. Friend and I had gone to church as the only woman bishop in Australia was there and neither of us wanted to miss that. Then we hotfooted it back here for lunch. We were planning a BBQ on the roof garden using the residents' big gas BBQ. However, there was a freezing gale blowing and it was far too unpleasant up there. So everyone congregated in my small place and my little Weber worked overtime cooking both chicken and lamb souvlaki, marinated chicken, sausages etc. It was a lovely meal, despite being spread over a long time. I packed up and sent heaps of leftovers home with each of them. The wrappers in the photos were from lovely Florentines one DIL made. She left me two which was what I asked for. She used chocolate and dried fruit from Alfafa House in Newtown which is a food co-operative which also sells to the public. Organic and usually fair traded stuff. Bring your own containers etc. Typical Newtown shop, but the products are always good quality. I eat untoasted, unsweetened muesli with stewed or frozen fruit for breakfast. I think I can count the Florentines as healthy? They had lots of dried fruit in them and very fresh nuts of several varieties. Very dark chocolate which packed a punch of caffeine. The florentines weren't the ones in cake shops which seem no thicker than a sheet of commercial pastry. These were chunky. And very delicious. # 2 son brought these for me. I always tell them "no presents" and they always pay no attention to me. Must be the way I brought them up or something! These are miniature tulips, as white as can be. Just beautiful, they are about a third the size of a normal tulip. I don't buy flowers usually and had really wanted some when I was shopping on Friday. However everything was very expensive and I refused to buy any. I couldn't work out why till I remembered Mothers' Day. This is not a post I take any pleasure in writing. I do not think as many people here in Australia will be affected as in Britain, but there may be some. All Craft Media, the last, so far, incarnation from Kerrie Allman's string of failed businesses stretching back to Magknits, is now under administration. This follows not long after failed KAL went into liquidation and was rescued by close family, turning into ACM. She had a list of craft magazines and appeared to open a new one as each preceding magazine got into strife. She also had, and this is where some may be affected here, an amigurami club and clubs for sock and lace wool. Members of these have been chasing for refunds, deliveries of yarn, deliveries of patterns etc. They have been fobbed off with varied excuses, none of which hold water. Her staff have not been paid and designers have not had samples returned or been paid for their designs which have been published in her magazines and worse yet, have been on-sold to other magazines without permission or payment. Our own Pompom is a moderator on the Ravelry group set up by those who are missing money, yarn, whatever. If you are out of pocket, one of the threads stickied at the top gives details as to how you can put in a claim. Another gives a list compiled by Pompom of the history of this mess. I am not personally involved and have no claim. However, I joined the group as some extra support, remembering the nasty mess that I was involved in some seventeen months ago. Many of us had joined a group buying yarn from an indie supplier and dyer down here. I joined after I had already had several very satisfactory purchases of good yarn with beautiful colours. I thought all would continue this way. Sad to say, things deteriorated and deliveries were late or did not happen. The person concerned had two other small businesses in different fields and it seems these were bad too. The tactics were the same as ACM. Promises, later proven false, no information forthcoming, no emails answered, no response to phone calls, complaints from the owner about being harassed and more. It took a lot of very public complaining and exposure of tactics to get anywhere. I did re eventually receive the full quota of deliveries, all in one package. However the yarn was not what had been promised and certainly was not the quality of promised yarn. I remember how terrible I felt through this, sick in the stomach even, so I joined the group for ACM as support. If you, or anyone you know may have been affected by this, please let them see the links as a claim may just possibly help. A claim will at least help administrator see the scope of the deceit.